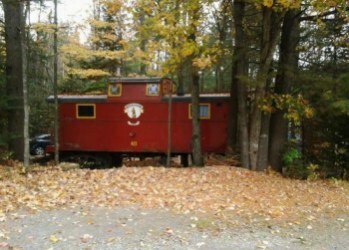 Children and Adults enjoy this authentic 1932 Boston & Main Caboose. Completely restored, this B&M #422 is set upon its own rails among the cool and fragrant pines, awaiting the next imaginary trip from our KOA Campground to wherever you wish to go. This two-room Kaboose provides clean, dry, safe and cozy sleeping for 6 people. There is a bunk room with 4 bunks and a separate room with a double bed. With so much charm and storage to take the fuss out of your camping vacation, you will sleep like a baby. (Just bring your bedding and pillows) Situated close to the Main Lodge, it is a very short walk to all the facilities including the restrooms, laundry, dishwashing station, campstore, gameroom, playground and swimming pool. You also have a nice wooded site, with picnic table, fireplace and BBQ grill, as well as fresh town water. 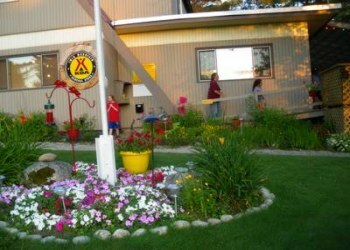 Come enjoy the Twin Mountain KOA, an award-winning campground in the heart of New Hampshire's scenic White Mountains. We offer the best in New Hampshire family camping where great memories are made! Enjoy nearby hiking trails, fishing, biking and more. Look for moose on guided tours, ride the famous Cog Railway and explore Mount Washington, the highest peak in the Northeast. Santa's Village, Six Gun City, Story Land and other family theme parks are all within a short drive. Plus, the beautiful fall colors are not to be missed.